This window is one that I am struggling to really come to terms with, why? Because I have no idea whether to be optimistic or apprehensive for the season ahead. In my opinion we are still 3 or 4 signings away from competing for a top 8 or even 10 position. I think Javier Hernandez is a fantastic player and the type of professional on and off the pitch that we should be aiming to bring into the club. However he is not a proven 20+ goal a season striker. He scored 20 goals across all Competitions in the great 2010/11 season for Manchester United (not such a great one for us!) – but he had the world class talents of Berbatov, Tevez and a truly brilliant Nani on the wing that season to aid him to his 13 League Goal. To put that into perspective, Antonio our top scorer last season, scored 9 goals last season despite missing 9 games. And my worry is that he is simply not enough along side our current injury prone triplet in competition for a striker role. At the moment we have 4 attacking players on upwards of 80,000 a week, Carroll, Ayew, Arnautovic and Hernandez. With Lanzini hopefully added to the list soon signing a new contract. However only one of this is regarded as both a regularly fit player and goalscorer, yet he is still to even make his competitive debut. The signing of Arnautovic is another great one, a player who’s entering his prime and show’s the promise to be a real fan favourite with his size, power, skill and pace. The idea of Arnie on the wing and Antonio on the right wing is one that I think West Ham fans have every right to be optimistic about. Ayew is then surely the first player to fill in either wing side or centre forward with Sofiane.F and Snodgrass seemingly on the way out the door. 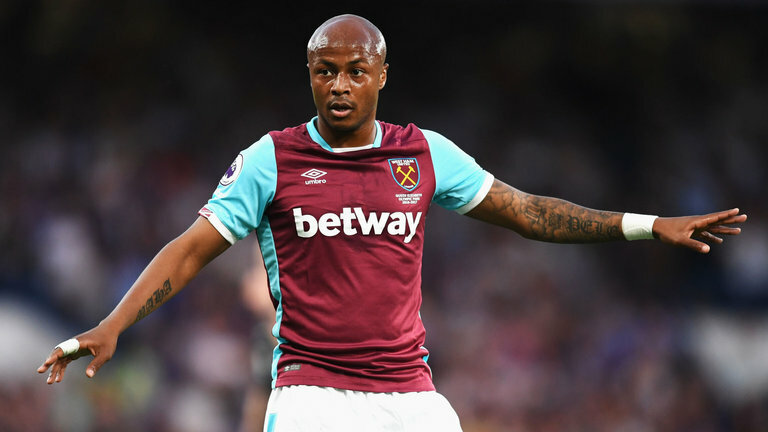 I am a fan of Ayew, despite his injuries he is a quick and skilful player who also has a habit of finding the back of the net. With the injury prone triplet of Carroll, Sakho and Ayew (who’s injury history I discussed at length in my Gary Lewin article), David Sullivan spoke to the press and stated that Sakho should be 100% for the start of the season, this to my mind is either a sick joke on West Ham fans. You could argue it is a simple ploy to place the player in the shop window, however my cynical West Ham fan nature is not so sure! The notion of an injury free Sakho is one that we know has the potential to find the back of the net, however it is one that worries me! Due to the nature of his back injury itself, the likelihood of him staying injury free for more than a few months are high and extremely unlikely. Aside from goals, a fully fit Sakho also brings his well known toxic attitude, and even further risk of inflating his ego with which he can potentially cause trouble. I personally think we need to get shot of him, whether it is simply to free up his 35,000 weekly wages or simply reduce the risk of dressing room unrest. The 16 million we nearly received for him last year is only the stuff of dreams for us at the moment, and I would bite your hand off for even half of that! Should Carroll and Sakho become injured (more a matter of when) then we have Ayew and the unproven but clearly talented Martinez to choose from to partner or replace Hernandez. I would love to bring youth through with Martinez regularly coming on late in the games to run defences ragged, however I think we need to look at someone bigger for that role – Andy Carroll. Martinez should in my opinion be out cup striker, starting all our cup games and getting game time that way. Carroll should be seen as nothing more than a bit part player in my mind, I think that in terms of reducing injury risk and keeping him fit for as long as possible, we should only use him as such. Particularly over the first few months of his injury return, we should just chuck him on during the last 20 minutes of games and let him throw himself about and bully defences. We simply cannot rely on him to be anything close to a regular starter this season, because it feels like as soon as we do, he picks up another long term injury. The negativity around him at the moment, wether it be in his off field antics, regular injuries or the constant disappointment of reading he won’t make the squads week after week, is something detrimental to both players and fans. Personally if we could sell him for anything over 10 million I would help him move out his house and help with the fixtures and fittings at his new gaff. This would make a big physical striker top of our priority list, I would aim for Llorente who scored 15 League goals last season. And then aim for an ambitious loan with an option to buy in the form of Batshuayi. But another concerning factor for me is that we also need more signings across the park. Specifically the middle of the pitch is a worry for us, as @Farehamhammer brilliantly put just the other day when discussing this issue! I love Noble and I think that taking into account the elements of professionalism and Passion he brings are priceless, however he has only shown glimpses of the quality we truly need to see. Take for example our last season at the Boleyn, he showed glimpses of Scott Parker’s central midfield quality. He would break up play, burst forward and his passing was more often than not accurate. In contrast to last season and arguably multiple prior, he failed to do so on a regular basis. Noble however is almost unsellable with the overall elements, including passion and love of the club, however I do think he should be considered a squad player. Hopefully being introduced into our staff and coaching setup over the course of the coming seasons. What I personally think we need to find a true engine and powerhouse in Central Midfielder. Look at how important Kante was to both Leicester and Chelsea’s title winning seasons, having that player who is not worried about getting stuck in and running countless miles on the pitch, whether it is to chase back or break forward is a priceless thing for a side. Obiang’s composure, range of passing and great technique are something that was priceless to the team last season. Kouyate compliments him incredibly well too with his height, strength, power and aerial presence. But most importantly in my opinion is the ability to win back and retain possession, West Ham simply give the ball away too often. It has been our downfall for years. With Oxford out on loan, I would love to see Fernandez get his shot in the middle of the park more regularly. He has impressed me with his pace and presence on the pitch, particularly during our win against Chelsea in the Cup, however I cannot see him as much of a ball winning midfielder. Who would I sign to try and add that quality to our squad? That is a really tough question, I like Wilshere, but he is neither physically imposing or consistently fit, which is surely a massive requirement for someone entering our side. Lewis Baker is top talent off the Chelsea production and youth player shopping lists, at 22 I think he is another with a big point to prove. If we could sign him on either a loan or permanent deal, I feel he could really drive our midfield forward. On loan at Vitesse last year he really impressed with his overall play, willingness to run and technique. I think despite his impressive time on loan, he is a player who would not cost a huge amount to bring across London. If I were to be even more ambitious, why not pull out all the stops to bring in Renato Sanches from Bayern Munich. The promising centre mid has been told he can leave the Allianz Arena on loan or permanently after struggling to cement a first team place…I see this as a total shot in the dark to be honest. But if you don’t ask you don’t get! And it would be a good statement for our club to have taken in one of Europes hottest young properties, even if it is only on a loan deal. Sanchez is an incredibly powerful and speedy player who I think could be a starter for any of the clubs outside the top 4. If you wanted someone not as physically imposing, but more of a defensive minded player then Malaga’s Pablo Fornals would be a fantastic addition who is valued at around 11 Million Euros. He isn’t a house hold name, nor is he as flamboyant as Sanches, but his energy and technique are his real strengths! Before I end this article, I want to take a moment to say that I am one of the fans who is neither board in or out. However even the biggest board supporter would concede that the transfer policy is truly shocking, whether it be out constant leaks to the press, the sniping at suggested targets or even just declaring interest in every player under the sun before just fizzling it out slowly. They have taken on our debt and spent incredibly well when faced with the challenge of returning us into the top flight and then cementing us back there. Our wage structure has ballooned and we have seen the club sign our first ever 20million pound players. However I fear that they are still reluctant to spend big on individual players, merely stating interest and not pulling out all the stops to sign a real talent.You only have to look at the amount of money spent overall this summer, 19million pounds, something that could soon greatly decrease should the sale of Feghouli go through. The supposed 50, 60 or even 80million budget that was suggested is what we need to compete for a top posistion. I am aware I might sound like an Ungateful c**t here, to which numerous fans have called me on Twitter! But The Boleyn Ground, Payet and Season ticket sales money is well in excess of that. But with the constant statements of intent and promise of players, they simply cannot believe the owners believe we have enough to challenge for a top 10 or 8 place in the crazy spending League. I would love to hear what you think and your transfer views @StevenMcCarthy9 and hopefully this article is proved to be terribly wrong by the end of next season! COYI’s!! !